My name is Hassan Aly Selim and I'm a Student in the German University in Cairo. 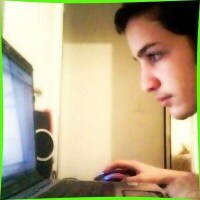 I'm a Programming Geek, I like to develop games and apps in my free time. I'm also a PC Gamer (but not a Pro), I play Strategy Games (like Red Alert 3), Racing Games (mainly the Need For Speed series & DiRT 2) and FPS Games (mainly the Call of Duty series). I'm always online and keeping up with the latest Tech news (thanks to Twitter). I have an infinite number of online accounts on all kinds of web services, most of them are here. I'm also a fan of Photo Editing, and started making some Photos with cool Effects (most of them inlude me having some sort of super power or special ability ). If you haven't guessed it from my Blog, I'm a PC guy and a fan of Microsoft, however I also consider Linux to be a good OS Kernel (I tried Ubuntu for a while) and I like Open Source. If you want to reach me (almost) instantly, contact me through my Twitter Account!